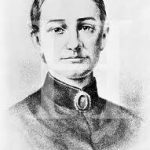 Caroline Kirkland (1801–1864) was a relatively early American writer, and author of three books about frontier days on the Michigan frontier. As an editor, Kirkland demonstrated a strong commitment to realism in the materials she accepted for publication and considerable critical skill in her reviews, including an enthusiastic response to Herman Melville’s early books. On January 11, 1801 Caroline Mathilda Stansbury was born into a middle class family in New York City, where she spent most of her childhood and adolescence. She was the oldest of eleven children born to Samuel and Eliza Alexander Stansbury. Caroline grew up in a loving and tolerant family and enjoyed many advantages as a girl. Her mother was herself a poet and fiction author, and Caroline later revised and published some of her mother’s work in her own gift books. The Stansbury family, though not well off, had social position. Caroline attended her aunt’s prestigious school for young ladies, where she was always at the head of her class and excelled in music and dance. She later assisted her aunt, Lydia Philadelphia Mott, who became headmistress at several academically outstanding schools for young women. Her father died when she was 21, making Caroline mainly responsible for the rest of the family. She persuaded her mother and siblings to move with her to Clinton in upstate New York, where she was teaching. By that time she had also met William Kirkland who was a teacher at Hamilton College in Clinton. Caroline married William Kirkland on January 10, 1828 and eventually had seven children, four of whom survived early childhood. The Kirklands settled in Geneva, New York, where they founded the Domestic School for boys. They believed their students should live as part of their family, hence the name Domestic School. Caroline must have been very busy there, caring for her own children and the resident boys. In 1835 the Kirklands moved to the Detroit, Michigan – little more than a western frontier town – where Mr. Kirkland had accepted a position as head of the new Detroit Female Seminary. Caroline was 34 years old, the mother of four small children, and a teacher at the Seminary. Tired of teaching, William had dreams of buying land and founding a city on the Michigan frontier. In January 1836, William Kirkland started buying land sixty miles west of Detroit in Livingston County. By the end of the year he owned 800 acres and with his father controlled 1300 acres altogether. In the fall of 1837 the couple moved there and founded a town Caroline named Pinckney, even more isolated than Detroit. There the family lived in a log cabin until a frame house was built. Caroline raised her children, shared her husband’s efforts to develop the settlement, befriended other women, went to the social affairs and observed the people who lived in their community. Caroline wrote of her experiences on the frontier and the people she met there in letters to her family and friends. Her observations were optimistic, sympathetic and very entertaining. Evidently her family’s appreciation of her stories encouraged her to produce a series of sketches of life in the Michigan Territory. The experiment in settling the frontier was a failure, but it provided material for Caroline Kirkland’s first book, an account of settlement life titled A New Home – Who’ll Follow? This was a partly satirical look at the trials and tribulations of traveling to the West and adjusting to life on the frontier. She also began writing essays and sketches for a variety of magazines. Published under the pseudonym Mary Clavers in 1839, her book became a literary sensation that caught world-wide recognition as a new American style combining wit with realism and accuracy. Kirkland did not just describe the people; she told their whole story. By 1842, following many admiring reviews from critics, including one by Edgar Allan Poe, the book had been given two more printings. Mrs. Kirkland’s A New Home, published under the nom de plume Mary Clavers, wrought an undoubted sensation. The cause lay not so much in picturesque description, in racy humor, or in animated individual portraiture, as in truth and novelty. The west at the time was a field comparatively untrodden by the sketcher or the novelist. In certain works, to be sure, we had obtained brief glimpses of character strange to us sojourners in the civilized east, but to Mrs. Kirkland alone we were indebted for our acquaintance with the home and home-life of the backwoodsman. With a fidelity and vigor that prove her pictures to be taken from the very life, she has represented scenes that could have occurred only as and where she has described them. She has placed before us the veritable settlers of the forest, with all their peculiarities, national and individual; their free and fearless spirit; their homely utilitarian views; their shrewd out-looking for self-interest; their thrifty care and inventions multiform; their coarseness of manner, united with real delicacy and substantial kindness when their sympathies are called into action – in a word, with all the characteristics of the Yankee, in a region where the salient points of character are unsmoothed by contact with society. Unfortunately, her neighbors soon realized that they were the subjects of the sketches in A New Home and did not appreciate her writing style. The local people thought they had been exposed, and that Caroline had made them look ridiculous by revealing their mannerisms and foibles. The Kirklands soon became outsiders in their own village. Caroline had not meant to ridicule her neighbors. More than anyone else, she recognized their true worth. She had entered into the everyday life of establishing a home, raising her children, accepting help from her neighbors when she and her husband both became sick, and extending her own support to them when they needed her help. She always insisted that her experiences on the frontier had developed her own character and that her contact with the settlers had improved her enjoyment of life there. The response of the settlers to A New Home obviously affected her writing style because her subsequent books were somewhat toned down. Two other books on Michigan life followed Kirkland’s first success: A Forest Life (1842) and Western Clearings (1845), a collection of stories that earned especially high marks from Poe. 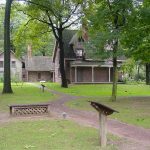 The Kirklands left Michigan in 1843 because their venture to establish the town of Pinckney was not a financial success, and they probably felt shut out by the reactions of their neighbors to Caroline’s frank observations of frontier life. They moved to New York City, where William entered the newspaper field and became editor in 1846 of the New York Evening Mirror and his own paper, The Christian Inquirer. Caroline opened a school for girls and continued her literary pursuits, writing scores of articles for newspapers and magazines. She was also the center of a group of writers, editors, professors and professional people in New York that included Edgar Allan Poe, William Cullen Bryant and Elizabeth Drew Stoddard. Her home served as a literary salon and she often entertained publishers and other notables. William Kirkland was near-sighted and hard of hearing. In 1846 he accidentally walked off a pier and drowned. His tragic death stunned Caroline and left her even more dependent on her writing and her friends. At forty-five she became the sole support of herself and her four children. She traveled abroad twice where she met Charles Dickens, Robert and Elizabeth Barrett Brownings, and Harriet Martineau, with whom she became close friends. The Union Magazine of Literature and Art hired Caroline as its editor in 1847, and through her efforts published some of the most important writers of the day. Her articles for this magazine and others throughout the 1840s and 1850s represent an important chronicle of American society and art. During the 1850s she published a biography of George Washington for children. 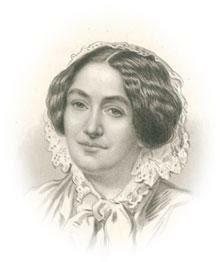 During the 1850s Caroline also helped her own son Joseph establish a literary career. Apparently she did not stray too far afield from the realistic style of writing she used to describe her Michigan neighbors in A New Home. At least to some degree, Joseph Kirkland seems to have learned this technique from his mother. In American literature, the term realism encompasses the period of time from the Civil War to the turn of the century when William Dean Howells, Rebecca Harding Davis, Henry James, Mark Twain and others wrote fiction devoted to an accurate representation of American life. Among the writers considered realists were Joseph Kirkland, E. W. Howe and Hamlin Garland. 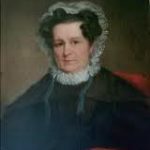 Caroline Kirkland was a quiet champion of women’s rights and a strong opponent of slavery, and was deeply committed to the Union effort through her work for the U.S. Sanitary Commission during the Civil War. When her son Joseph enlisted in the Union Army she was always concerned for his safety. The Civil War sanitary fairs represent one of the most successful humanitarian and philanthropic efforts in American history. These fairs raised millions of dollars for the medical care of Union soldiers and provided a way for civilians to contribute time, energy and money to show their support. The largest such extravaganza was New York City’s Metropolitan Fair held in Union Square in the spring of 1864. To calm her anxiety over the safety of her son who was fighting in the Union Army, Caroline threw her energies into the organization of the Metropolitan Fair. Two nights after the fair opened she died in her sleep, on April 6, 1864. 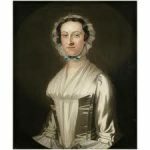 Caroline Kirkland enjoyed considerable fame and accolades from her writings during her lifetime, and was a significant American writer. Her works continue to be studied in relation to style, contributions to American literature and the influence of the female perspective.